Take better control of your concrete quality using MRC-Pro. It displays both mixing and total revolutions, as well as RPM and mixing time since last reset. Tamper-proof reset interlock prevents altering of counts. It requires a reset cable to restart counts. The super bright LED display makes it easy to read under direct sunlight. Approved by NYSDOT and NJSDOT, the MRC-Pro is required for state projects. What kind proximity sensor does MRC-Pro work with? NPN three wire proximity sensor. 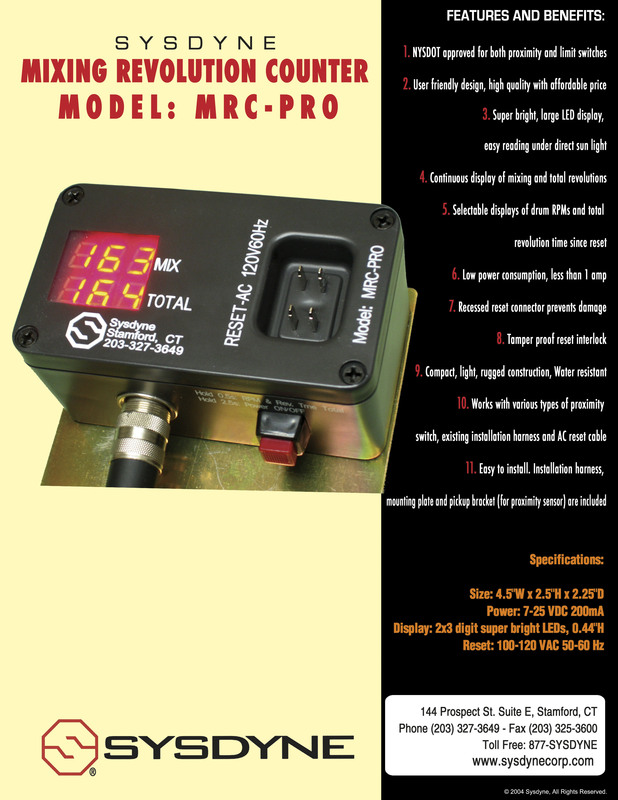 We don’t guarantee that MRC-Pro will work with all types of NPN sensors. To ensure quality, please contact us for your sensor needs. Counter doesn’t display ‘RES” even though the power cable is connected. Check power source and harness connections. Counter is on and resets, but no lights come on when steel is near the sensor. Counter resets and lights go on but the counter doesn’t count after adjustment. Ensure the fork-plate is mounted in the right direction (the narrow fork on the plate should pass the sensor first). Slow the drum speed and check if the decimal point on the counter display blinks twice after the fork passes the sensor. Check mounting dimensions of the sensor. The dot flashes, but neither the MIX count or TOTAL count change when the drum rotates. Check the mounting of the fork plate (see user manual). Counter may be configured for incorrect application (see user manual). The light on the back of the proximity sensor is on even when the fork-plate is more than a foot away from it. Ensure that the face of the sensor is at least 2 ¾ inches away from the sensor bracket. If it is, make sure there are no other metal objects in the vicinity of the sensor. The counter registers counts in the wrong drum direction only. The fork plate is most likely mounted backwards. See “Mounting the Sensor” in the User Manual for proper plate arrangement. It doesn’t work and I have no clue why.